Readers, thank you for your hearty response to yesterday’s post. Not even a few hours had gone by since publishing when comments, emails, and Facebook messages started to pour in with helpful and supportive reactions to the Psalm Proposal from across our federation. I’d like to follow up on yesterday’s post by exploring some specifications and statistics of the URC/OPC Psalm Proposal. Due to my lack of time for detailed study, these figures are rough and possibly a little out-of-date (since the Psalm Proposal is undergoing continual revision). Nevertheless, for the purposes of a general overview, I hope they will suffice. As always, please comment or contact me to provide corrections. For much of the following data I am indebted to the ever-helpful URC Songbook Committee chairman Rev. Derrick Vander Meulen, and to Rev. John Bouwers and the congregation of Immanuel Orthodox Reformed Church (URCNA) in Jordan, Ontario. Information on the Reformed Presbyterian psalters comes from a Geneva professor and the former director of my college choir, Dr. Robert Copeland. See his essay “The Experience of Singing the Psalms” in the front matter of The Book of Psalms for Worship (Pittsburgh: Crown and Covenant, 2009), xvi-xvii. URC members hoping to see a mere revision of the blue Psalter Hymnal may be unprepared for the extent of the Songbook Committee’s work. 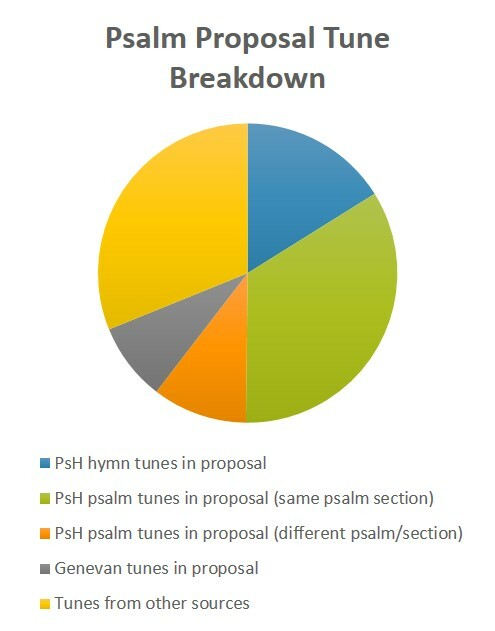 Only about 45% of the proposed selections utilize psalm tunes from the blue book, and only 35% or so preserve the original tune for the equivalent psalm section in the PsH. (Another 15% of the proposal’s tunes can be found in the blue Psalter Hymnal’s hymn section.) For the texts, conducting an accurate survey is much more time-consuming, but I think it’s safe to say that relatively few selections maintain the original wording of the Psalter Hymnal; for most songs the committee has either modernized the language of the 1912 Psalter or taken up entirely different (though faithful) versifications. The Psalm Proposal will offer United Reformed congregations a chance to preserve the rich psalm-singing heritage handed down to them from the Dutch Reformed tradition which utilized the 1551 Genevan Psalter. At a glance I see no less than 23 Genevan tunes listed in the index of the proposal, of which at least four do not appear in the blue Psalter Hymnal. By and large the texts for these settings are derived from the Canadian Reformed Churches’ ongoing work on their own Book of Praise. ABERYSTWYTH, LLANGLOFFAN, TARWATHIE, LLEF—whence are all these extraordinary tune names? One of the biggest sectors of the Psalm Proposal’s contents brings in selections of Scottish origin (along with their distinctly Anglo-Saxon tune names) from the Reformed Presbyterian Book of Psalms for Singing and more recent Book of Psalms for Worship. Both songbooks have their origins not in the continental Genevan Psalter, but in the Scottish Psalter of 1650. A bit of historical background may be helpful here. Recall that the CRC’s red and blue Psalter Hymnals derived their psalm settings almost exclusively from the 1912 United Presbyterian Psalter, which the joint work of several Reformed and Presbyterian denominations (as I mentioned in yesterday’s post). Although the Reformed Presbyterian Church initially contributed to the effort, this denomination objected to the United Presbyterians’ prioritization of good poetry over Scriptural accuracy, eventually withdrawing from the project to produce its own revision of the 1650 Scottish Psalter. Further revisions of this psalter were made in 1929 and 1950, leading to the RPCNA’s production of the Book of Psalms for Singing in 1973 and the Book of Psalms for Worship in 2009. The dichotomy between the poetic approach of the 1912 Psalter and the literal stance of the Book of Psalms for Singing / Worship is still evident today if one compares Christian Reformed psalm settings with Reformed Presbyterian versifications. All of this is to say that the Songbook Committee’s decision to prioritize RP settings over our more familiar ones could be interpreted in one of two ways: unfaithfulness to our own psalm-singing heritage, or a much-needed return to the Scriptural accuracy upheld in the descendants of the Scottish Psalter. One of the most exciting marks of a new psalm or hymn collection is the presence of good songs that have arisen in recent years from within our federation itself. Songbook Committee members have contributed their own talents to the Psalm Proposal by composing new tunes, creating new versifications, and writing new verses to finish formerly incomplete psalm settings. Several selections from the proposal are mostly or entirely the work of URCNA members. As this brief exploration demonstrates, the Psalm Proposal draws from an incredible diversity of sources. Of all the complaints that could be leveled against its contents, limited scope is not one of them. 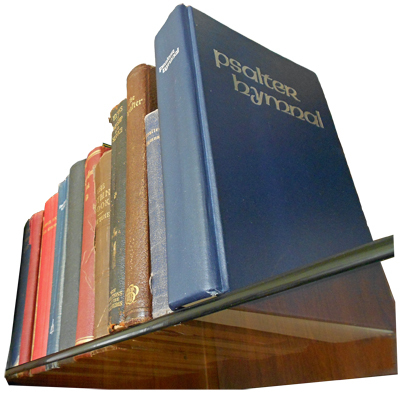 However, there are many other considerations involved in the lengthy process of transitioning to a new Psalter Hymnal. Lord willing, we’ll continue tomorrow by examining the strengths and weaknesses of particular Psalm Proposal selections. Your comments, as always, are appreciated. This week we pause URC Psalmody’s “regular programming” (if it can even be called that) to attempt to answer this question. It’s been so long since the topic of the proposed URC/OPC Psalter-Hymnal has come up that even its dedicated page on this blog has grown out-of-date. To minimize any misunderstandings regarding this multi-faceted topic, I’d like to start slowly—bear with me. Although unity is a beautiful thing, it also presents challenges in learning to understand each other’s differences—and music, of all topics, is most likely to excite heated debate. Think about it: only ecclesiastically-minded members (may I call us “church nerds”?) care about the differences between the URCNA and the OPC with regard to synodical authority, for example, or the roles of office-bearers. Yet the songbook that each denomination uses sits in the rack behind every pew, affecting just about every member of the church on a weekly basis. And while extensive experience in the area of church music is rare, everyone has an opinion on it. Even before the merger with the OPC’s efforts in 2012, the URC’s Hymn Proposal, released in the summer of 2010, generated heated and extensive controversy. It was not long before the blogosphere erupted with a myriad of articles questioning the integrity of the collection, or even challenging the motives of the Songbook Committee itself. 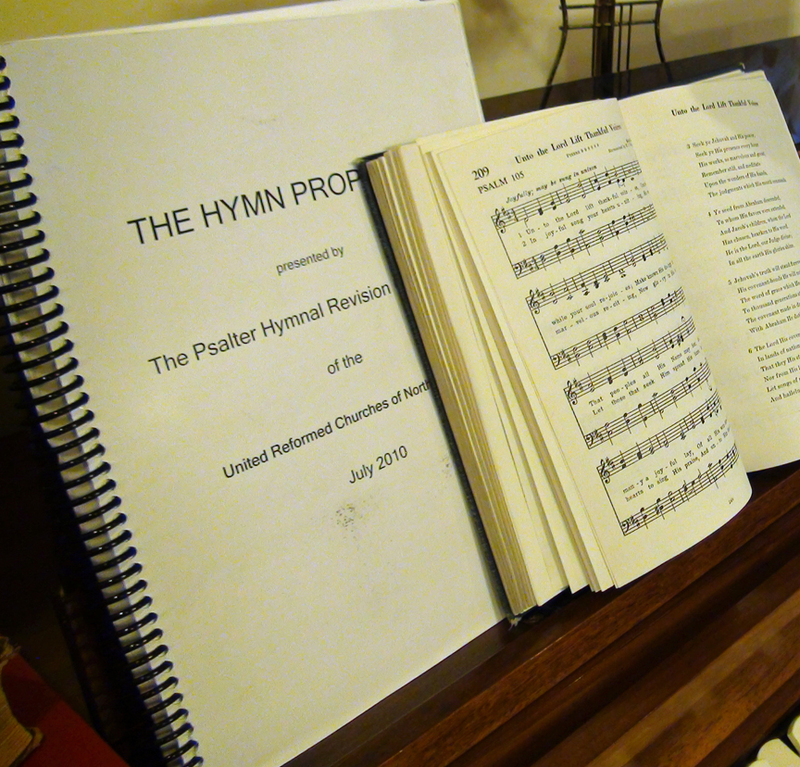 As a rather opinionated fifteen-year-old with what I considered sufficient knowledge of Reformed hymnody, I began to collect my own thoughts and concerns regarding the Hymn Proposal, ultimately submitting an 88-page report to my own consistory. Although my approach was almost certainly over-zealous, many other URC members shared my worries. By the time Synod 2012 convened, its agenda had amassed five overtures and one appeal regarding the proposed Psalter Hymnal from two classes and one consistory. The chief result of the musical deliberations at Synod 2012 was that the URCNA approved the proposal to merge efforts with the OPC. First the URC’s Songbook Committee would work together with the OPC’s committee to adapt the psalm section the OPC had already almost completed; then the Hymn Proposal would be revisited. Cognizant of the significant concerns expressed via the overtures to Synod 2012, Songbook Committee chairman Rev. Derrick Vander Meulen assured members in an October 2012 report that “this final hymn collection submitted to synod will be quite different from the Hymn Proposal previously distributed.” In November 2012, reporting on their progress in compiling a Psalm Proposal, the Committee noted that it was “especially sensitive to maintain important continuity with the blue Psalter Hymnal.” This desire to remain faithful to our churches’ rich heritage of psalmody and hymnody has remained evident in all of the Songbook Committee’s most recent communications to the churches. This brief historical rundown brings us to the current status of the project. After the OPC’s General Assembly met in June of 2013, the two Songbook Committees released a digital version of the complete Psalm Proposal at a website specifically created for the purpose, PsalterHymnal.org. Shortly thereafter, the URC Songbook Committee sent a letter to the consistories of all United Reformed congregations announcing the availability of this website for any interested church members. This is an excellent step forward, but I have some concerns as well. While PsalterHymnal.org provides an email address to which comments and concerns can be sent (comments@psalterhymnal.org), the URC committee has not established any formal feedback process like the one utilized in the time of the Hymn Proposal. Although this prevents reams of musically technical recommendations from being awkwardly assigned to synod’s deliberation, I fear that it has also inhibited much of the conversation that is not only healthy but necessary for the quality of the finished product. And the period for feedback expires December 31st, 2013. Although the Songbook Committee is competent to provide us with a solid and Biblically-sound book of praise, the very nature of their work tends to obscure the needs and desires of the average congregation. Silence from the churches forces the committee’s members to act without vital feedback on the Psalm Proposal—feedback, I should add, which they themselves have requested. With less than ten weeks left in which to submit comments regarding the Psalm Proposal, our congregations’ review process should have started months ago. Needless to say, all of us have busy lives and plentiful commitments. As a busy college student with civil engineering as a stated major, my schedule isn’t exactly free either. But if you struggle to find motivation to carefully consider this collection of songs, remember that the decisions made now will affect the musical heritage of our churches ten, twenty, maybe fifty years from now—profoundly, if not irrevocably. If the hymns under consideration for our churches’ use were an important matter, how much more critical are the psalms! We have entrusted this committee of fallible men and women to provide us with accurate and beautiful versifications of God’s Word itself, the singing of which is a divinely-required ordinance in worship. If we fail to interact with the Songbook Committee’s work now, not only do we insult the hard labor they have been faithfully been carrying out for nearly fifteen years, we also gravely disservice future generations. Over the next week I’ll be attempting to evaluate various aspects of the Psalm Proposal, as I have time. If you’d like to join in this review, I’d encourage you to contact Songbook Committee chairman Rev. Vander Meulen at derrickvandermeulen@gmail.com for the username and password required to access the digital version of the Psalm Proposal at PsalterHymnal.org. The collection is password-protected merely to prevent abuse of the sheet music, for which copyright permissions have not yet been secured. Feel free to leave your own comments here, as always; I’d love to see URC Psalmody fulfill its intended role as a discussion forum rather than a lecture podium. Readers, we have the opportunity to make our federation’s new songbook the finest it can possibly be, for God’s glory. With grace, humility, and plenty of prayer, let’s give it our best effort. A popular view of the fourth commandment in many theological circles classifies it as a part of the ceremonial law, distinct from the moral laws represented in the rest of the Decalogue. Although the Heidelberg Catechism is silent on the nature of this command, it clearly assumes that observance of the Lord’s Day should shape the Christian life of gratitude as much as any other ordinance. Yet the fourth commandment presents anything but a “go-to-church-at-least-once-every-Sunday” kind of legalism. Rather, as the Catechism shows, it impresses upon us an attitude of worship from the heart every day of our lives, and an expectancy of “the eternal Sabbath” that awaits us in heaven. Today, as we continue in URC Psalmody’s series through the Heidelberg Catechism, we’ll consider the teaching of Lord’s Day 38. “That, especially on the festive day of rest, I regularly attend the assembly of God’s people.” Psalm 48 sets forth in glorious language the majesty of God’s holy city—for the Old Testament, Jerusalem; for the New Testament, the Church universal. Many a pastor has pointed out that there can be no “lone ranger” Christians; it is not only natural but necessary for a follower of Christ to unite himself with the body of believers, which is itself Christ’s bride and Christ’s city. As we “consider well her ramparts,” we ought to be compelled to join the rest of the Church universal in reverent worship. “I regularly attend the assembly of God’s people to learn what God’s Word teaches, to participate in the sacraments, to pray to God publicly, and to bring Christian offerings for the poor.” Too often Christians tend to fall into one of two extremes with regard to observing the fourth commandment: we are either encouraged to ignore it entirely, or urged to follow it strictly in a sense of guilt. According to the Catechism, neither pole is biblical. It ought to be our heartfelt desire to assemble for corporate worship as we realize the immense benefits Sabbath observance offers for both our physical and spiritual health. Psalm 122, as versified in the blue Psalter Hymnal, reflects this attitude. “That every day of my life I rest from my evil ways, let the Lord work in me through his Spirit, and so begin already in this life the eternal Sabbath.” Psalm 4 speaks sweetly of the true spiritual rest we can enjoy as God’s children. In his Sermon on the Mount, Christ gave this exhortation to his disciples: “Do not take an oath at all…Let what you say be simply ‘Yes’ or ‘No’; anything more than this comes from evil” (Matthew 6:36, 37). Does this commandment require Christians to abstain from any kind of oath-taking whatsoever? Lord’s Day 37 of the Heidelberg Catechism, our focus in today’s installment of this URC Psalmody series, continues to shed light on the third commandment by addressing this complex question. and were rightly used by Old and New Testament believers. No creature is worthy of such honor. We may swear an oath “in order to maintain and promote truth and trustworthiness for God’s glory and our neighbor’s good.” The psalmist David intersperses heartfelt praise and profound wisdom in Psalm 34. In verses 11-14 he addresses his audience as children to teach them the fear of the Lord. His exhortation: “Keep your tongue from evil and your lips from speaking deceit.” As the Catechism emphasizes, truthfulness does indeed bring glory to God. “A legitimate oath means calling upon God as the one who knows my heart to witness to my truthfulness and to punish me if I swear falsely.” Psalm 58 provides a negative example of the truthfulness spoken of in this question and answer by calling attention to wicked men’s lack of integrity. Psalm 119:121-128 pictures the cry of a humble believer seeking to follow the path of God’s righteousness, swimming against the entire cultural stream of the world. In fact, this section of Psalm 119 has in its gazes not just the third commandment, but all of God’s laws. May this prayer be ever on our lips as we strive to life in grateful devotion to our Lord. Now, O Lord, Thy power display.